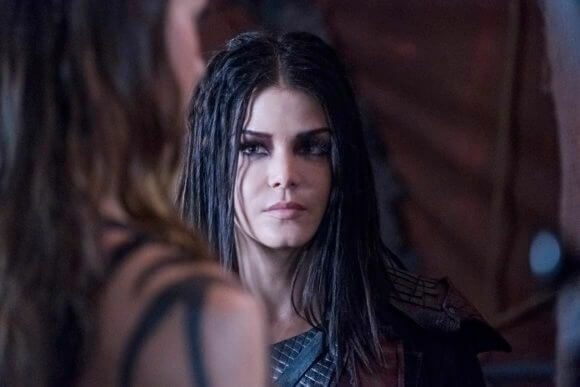 Octavia (played by Marie Avgeropoulos) will have a lot to atone for when The CW’s sci-fi action drama The 100 returns for its sixth season. Season five was a wild one for Octavia as she enforced brutal rules to keep those in the bunker as safe as possible. Season six will find Octavia dealing with the repercussions of her actions and the fallout from fracturing relationships. Marie Avgeropoulos took part in the 2019 WonderCon where she did her best not to give away spoilers during our roundtable interview. The sixth season of The 100 debuts on The CW on April 30, 2019. Murphy’s been described as the cockroach in the series. How would you describe your character as an animal or insect? Octavia went through a lot last season and there was obviously tension between her and Bellamy. Will we see that resolved or will that be a running storyline throughout the season? How did it feel to see the fan reaction to the screening of season six episode one? Did anything feel particularly different heading back into this season? Octavia’s been the leader so what kind of role will she have on this new world? Marie Avgeropoulos: “Well how do I tell you this without telling you anything at all? It’s always the hardest. They’re like, ‘Don’t tell them anything but talk to them, okay?’ As you tiptoe in and try not to lose your job. What can you expect from Octavia this year? Well, you can expect that you know when you hit rock bottom there’s only one way to look and that’s up. With Blodreina she had to make a lot of really tough decisions. A lot of those decisions, you know, came from like Abby explaining about cannibalism. That was such a crazy, awful, unfathomable idea to even do but she says, ‘If everybody doesn’t eat the guilt is going to happen and then there will be chaos. Do it.’ So, Octavia had to shoulder a lot of these choices, you know what I mean? It’s heartbreaking because even with the people who are loyal to her like Indra, she’s not sure where she stands. Marie Avgeropoulos: “Indra trained Octavia to become a warrior and I just love Adina Porter, like I just looked up to her as a mentor in real life. She’s such a great actress and woman. Hi, Adina, if you’re watching this. That’s a theme that’s going to continue?